I originally wrote this when Theon was 10 months old. Somehow time has Mo Farahed itself. As I sit here with a 6.5 month old who I’ve just rescued from under the armchair she’d backwards crawled herself into. And an almost 2.5 year old. 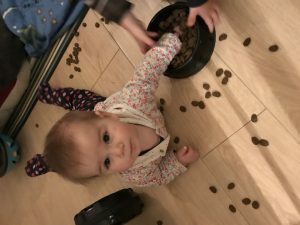 So, I thought I’d revisit this article in preparation for re baby proofing. Just writing this quickly while also waiting for my ebay bids on various baby gates to come through. They warned me about this stage, I scoffed, not me I thought. But then yesterday the above happened! I know, I know how irresponsible of me for taking a photo before taking action and yes those are my breast feeding vitamins he’s trying to hack his way into. My names Berrit and I’m a first time mum. I can almost hear the sigh of ‘ahhhhs’ ring out in chorus across the nation from all the multiple mamma’s and papa’s. They know the juggle struggle is real, they’ve already grieved the loss of their lives. Which brings me here, keys in hand ready to head out the door to pick up the most monstrous array of baby gates and other much needed child caging devices. Taking one last look at the remnants of my pre-baby years, Joni Mitchell’s Big Yellow Taxi playing loudly in my mind. And then he toddles in, dragging my hand bag with him and well you know the rest, they’ll be other white sparkly surfaces and adult only living rooms. But for now I’m just a mum standing in front of a boy asking him to stop eating things off of the floor. Flash forward (2019) What’s Changed? For one I’ve come to terms with the fact I’ll probs never have a cream couch again. Bothered! Theon is now a lot more stable on his feet and can navigate the stairs both up and down. However, now we’ve also a six month P on the crawl. 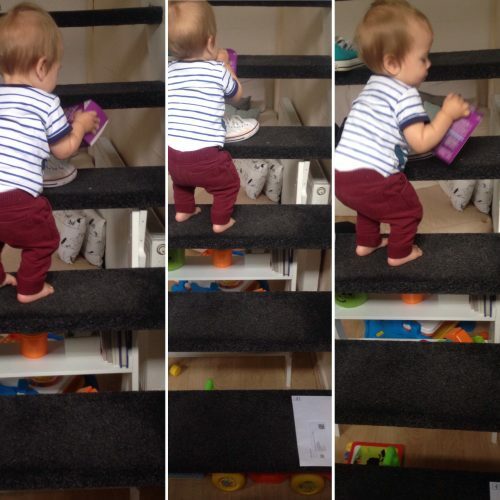 She’s started pulling herself up on to things and it’s only a matter of time before she discovers the stairs. I’m so not ready! However, more than stairs or crawling is the fact that I’m out numbered. I’ve more kids than sets of eyes and they tag team me. It’s like that scene in Jurassic Park where the little cute dinos take the bad guy down. They work as a team! Theon can reach high up to stuff that might not present any issues to him, but given to Penelope can be a real hazard! Everything really from safety locks, to gates to plug socket fillers. That was until I fell pregnant and they all became the bane of my existence! I’ve found it easier to keep detergents and other cleaning products in secure high up cupboards rather than locked away under the sink-I’ve seen Theon hang on doors until their hinges come off! It means they’re well out of harms way but easily accessed by me when I’m running around frantically trying to clean up during nap time. I always make sure PODs and other cleaning products have child safety locks on them. And the baby gate to the kitchen is ALWAYS kept shut. So that when I do tasks in there I’ve an extra safety barrier.